Category Archive for ‘music production’ « .Evolving Music. Outside Lands Remix Contest: Remix Gogol Bordello, My Morning Jacket, Rebirth Brass Band & Beats Antique For A Chance To Perform At Outside Lands!
. 0 Comments Tags: Beats Antique, Gogol Bordello, mixmatchmusic, MobBase, My Morning Jacket, Outside Lands, Outside Lands Remix Contest, Rebirth Brass Band, Remix Contests, Remix Wizard, Stems, Urb.com. In anticipation of their 3rd annual music and arts festival, Outside Lands has teamed up with MixMatchMusic and URB.com to host a badass remix contest featuring songs by Gogol Bordello, My Morning Jacket, Rebirth Brass Band and Beats Antique. Using MixMatchMusic’s Remix Wizard, anyone can have a crack at remixing and the winner will get a chance to perform at Outside Lands in front of thousands of festival goers! How cool is that? 7) Contest ends at 11:59pm on August 5th, 2010. Winners will be notified on August 6th, 2010. Each song will have one winner who will receive two general admission passes to the festival and a prize pack of CDs from the artist they remix. Each of these winners will go on to compete for the grand prize, which includes two passes to the festival with artist credentials, a custom MobBase iPhone app and lifetime subscription from MixMatchMusic, $500 for travel expenses, and a one-hour set in front of thousands of festival goers at Outside Lands! Gogol Bordello’s Trans-Continental Hustle, the group’s American Recordings debut, is perhaps the most ambitious undertaking in the group’s already remarkable decade-long gypsy punk career and it’s the result of an inspired, year-length collaboration with famed producer Rick Rubin. Gogol Bordello is arguably the hardest working — and hardest rocking — group of our discordant new century, maintaining a touring schedule and an onstage energy level that would send the average combo running for the emergency room. Kentucky-born My Morning Jacket formed in 1998 and has been going strong ever since. Their fifth full-length studio album, “Evil Urges” is the most far-ranging, surprising, and satisfying record of the band’s career. Have a go at remixing the freak-funk electro-slam of “Highly Suspicious” for your chance to win. Rebirth Brass Band, a New Orleans institution, evolved from playing the streets of the French Quarter to playing festivals and stages all over the world. Committed to upholding the tradition of brass bands, while at the same time incorporating modern music into their show, their signature brand of heavy funk has been winning over hearts for almost three decades. Beats Antique is an Oakland, CA based group forging a curious alliance between middle eastern traditions and potent west coast circus, underground hip hop, breakbeat brass band, downtempo, glitch and dubstep. Their paradoxical brand of electro-acoustic music is perfect fodder for the savvy remixer. The 3rd annual Outside Lands Music and Arts Festival takes place in beautiful Golden Gate Park in San Francisco on August 14 and 15, 2010. The two day festival is a celebration of music, food, wine and art that benefits the San Francisco Recreation & Park Department. It features over 40 bands, including Kings of Leon, The Strokes, Phoenix, My Morning Jacket, Further featuring Phil Lesh and Bob Weir, Wolfmother, Gogol Bordello, Al Green, Nas and Damien Marley, Tokyo Police Club and more! For complete, up-to-date information about Outside Lands click here. To start remixing, click here. 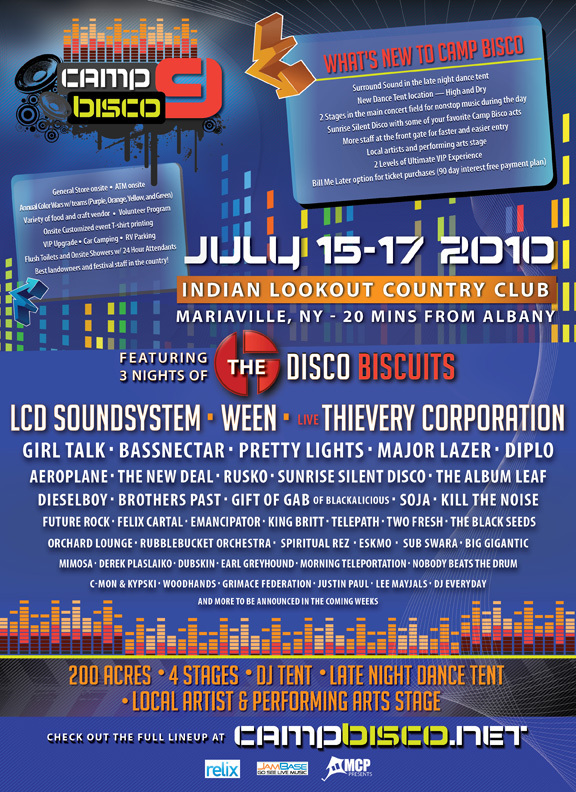 Camp Bisco Announces Remix Contest Winners and Launches iPhone App for Camp Bisco 9!
. 1 Comment Tags: Aman Ellis, Bassnectar, Black Seeds, Camp Bisco 9, Camp Bisco iPhone app, Camp Bisco Remix Contest, Caribou, Dave Cann, Diplo, Disco Biscuits, DJ Geoffro, Ed Haskins, Gift of Gab, Girl Talk, Hubsmoke Faccio & Reza, King Britt, LCD Soundsystem, mixmatchmusic, MobBase, music festivals, Remix Contests, Thievery Corporation, Topshotta, Urb.com. Since the Camp Bisco Remix Contest, powered by MixMatchMusic and URB.com, launched over a month ago in anticipation of the 9th annual Camp Bisco music festival in New York, over 130 amazing remixes have been submitted by aspiring DJs and musicians, and shared and voted on by fans. This was a contest of epic proportions that saw more entrants than previous Camp Bisco remix contests, all delivering wildly varied styles from nearly every continent. Today, we to bring you the winners! The coveted grand prize goes to DJ Geoffro aka Topshotta of Harrisburg, PA for his dubbed out remix of the Black Seeds‘ “Slingshot”! Among other things, Topshotta will be receiving a free iPhone app, powered by MobBase, and will get to perform at Camp Bisco in front of thousands of festival-goers. Congratulations! 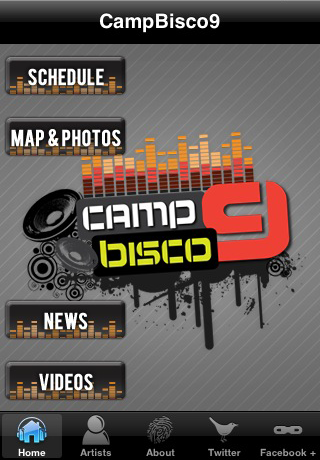 Today also marks the release of the official Camp Bisco iPhone app, powered by MobBase! Access artist bios, videos, photos, this year’s site map and schedule, a kickass photo gallery by veteran rock photographer Dave Cann, the facebook page, and of course the Camp Bisco twitter stream, all from the comfort of your own pocket. Be among those in the know, navigate your way around the festival with ease and be sure not to miss any of your favorite acts. Get this free app here. We’re two weeks away from Camp Bisco 9 (you can still buy tickets) and the official Camp Bisco iPhone app is the best way to stay connected during this summer’s premier 3-day music festival (July 15-17). The ridiculous line-up includes everybody from LCD Soundsystem and Thievery Corporation to Girl Talk, Diplo, Bassnectar, Caribou, Gift of Gab and more! Be sure to visit the Camp Bisco website for all the details!